We had a total of 19 hours in Germany during layovers to and from South Africa. This, of course, has made us the utmost experts in German culture. And you, dear reader, are probably eager to delve into some of the more subtle nuances of German culture we have unearthed. It's called Khao San Road, and you either love it or you hate it. And generally, you hate it. Most of the people we know do, anyway. It used to be just another residential street in the Banglampoo district of Bangkok, but that was before the backpackers came. The story is that during some important festival in the late 1980s (I forget which, exactly), budget tourists found all the low-cost accomodation in town booked up. Being outgoing little problem-solvers, they started knocking on doors, asking the locals living on Khao San to rent them rooms. The residents caught on quickly, and soon the first guesthouses emerged. Then bars and travel agencies followed, and well... things just kind of snowballed from there. 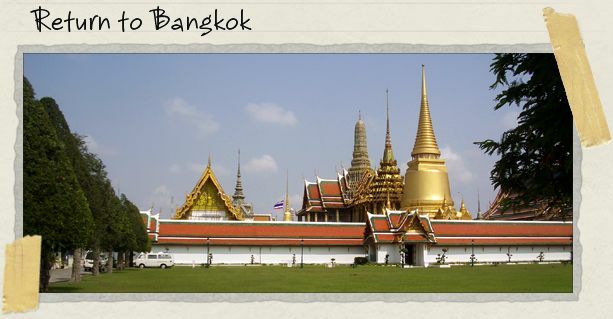 They really took off in a big way when the book The Beach was published (and then turned into a big-budget film starring Leonardo DiCaprio), and the number of tourists passing through Bankok went through the roof. The sidewalks are crowded with stalls, so it's no problem if you'd like to munch some deep-fried insects while having your hair braided and getting a fake ID. There are Beer Chang T-shirts, septum piercings, fisherman pants, bootleg CDs and some dirt-cheap pad thai, probably all available from the same street vendor. At the ubiquitous bars, "beer girls" in silk slips encourage inebriated tables of gap-year kids to order another round or three. As you try and push your way through throngs of people and clouds of pot smoke, tuk-tuk drivers will spring up to bar your way and seedily offer to take you to "ping-pong shows." A baby elephant will be led by on a chain begging for food, while the preacher on the corner loudly tries to save your immortal soul. Ok, maybe not. But I have to admit, I don't dislike the Khao San scene as much as some people (for instance, the lovely Jessica, who hates it with the heat of a nova). True, it does at times feel like it's just packed to the gills with the most horrible people in Thailand, tourists and locals both. But it's fun. It's the exhilaration of sensory overload, the exhuberant recklessness of taking everything to the logical extreme. And it's the best damn people-watching in the world. 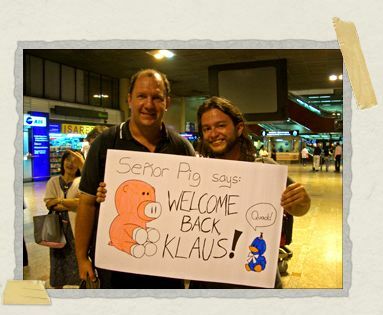 In Bangkok, we were once again reunited with our friend Klaus. We'd said goodbye to Klaus in Phnom Penh, whereupon he traveled to Indonesia for some scuba diving and we continued our exploration of Cambodia. We'd promised each other before parting ways that whoever arrived in Bangkok first would meet the other at the airport/bus station, preferably holding a sign of some sort. Now, the standard for these signs had been set some months before by our friends Michael and Sophie. And they'd set it quite high, at that. We traveled far and wide to gather the necessary supplies (a story for another time), and in the end we arrived at the airport clutching our humble offering. As amused as Klaus was, the reactions of the other passengers and staff were almost even more fun for us. Over the next few days, the three of us planned our next adventure together: The People's Democratic Republic of Laos. Our antics in Laos will be the subject of our next few posts. But first, one last Klaus-related anecdote. Some time ago, Jessica wrote a post about a day the three of us shared on the island of Ko Chang. Klaus, who is 38 years old, immediately emailed that post to his mother. Because he travels with a film camera and doesn't develop his prints until he gets home, it was the first time she'd ever been able to see a photo of him while he was traveling. I'm trying to decide if I'd like Khao San Road or be overwhelmed by seediness and tawdry. It does sound exciting, but I suspect that I'd veer more towards Jessica's opinion, but maybe less nova heat level and more campfire heat level. Oh yeah, found out recently that I'm most likely moving to Barcelona this summer. I hope we intersect in Philly before I leave. Or that you guys come and visit me. Hehehe… love the Klaus-Spotting bit– his momma must have been thrilled. 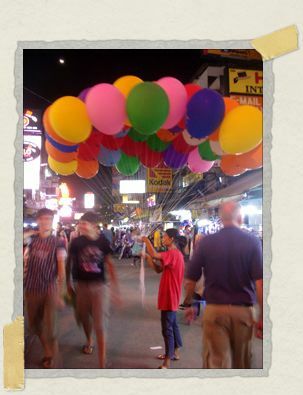 We love khao san road, well I do, well maybe not, but I do quite like it, a bit. Would love to be there now with you both. Do you know there is a cafe that serves proper English tea on khoa san. Klaus-spotting rocks. Khao-San sounds like something out of the 70's, something Kubrickish. No funny smoke for you! overloaded senses aren't my thing, either. hurray for meeting up with friends! the sign is quite adorable. They put the funny pictures of me on the internet!